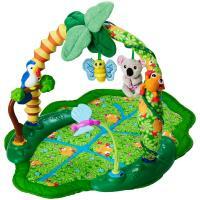 The Evenflo ExerSaucer Triple Fun Jungle is a very popular toy and activity center for babies. It has a number of different features and it can be used in several different ways, making it a good value, and the fun jungle theme makes it very cute and entertaining for babies. Let’s take a look at the ExerSaucer and see just what makes it so popular among parents… and babies, too! You might have heard that many experts are coming out and recommending that parents not use baby walkers due to them being both a safety hazard. As a matter of fact, some countries such as Canada have outright banned baby walkers! The ExerSaucer is meant to be a safe alternative to baby walkers, letting your baby get great exercise without exposing them to any safety hazards. Babies get exercise in the ExerSaucer by being able to rock, spin and bounce to their heart’s content, while the ExerSaucer itself remains completely stationary, making it very safe. The included playmat is perfect for newborns up to 4 months of age. 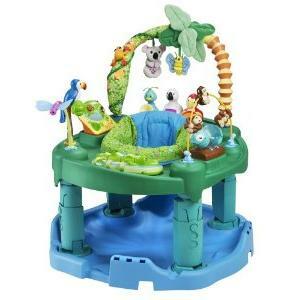 It is compatible with the toys that also work with the ExerSaucer itself, which include several “jungle-themed” animals and vines. The included animals are are cute toucan, butterfly, koala, dragonfly and frog, which I’m sure your baby will love. Even though Evenflo recommends the play mat for children up for 4 months of age, some parents remarked that their child still liked playing with it even when they were a bit older than that. Hey, if they still like it, you might as well let them play with it! Once your baby is of walking age, he or she will be ready to use the ExerSaucer itself. It’s a great way to help your baby not only exercise their body but their rapidly growing mind, too! All of the toys that work with the above playmat setup also work with the ExerSaucer itself, and its a ton of fun for children. There are lots of light up toys and sound effects that are not only fun to play with, but help stimulate your child’s senses as well. It’s designed with help from the Child Development Institute with educational toys that help your child reach 10 developmental milestones. There are several different light up—and music & sound effect playing—toys in the ExerSaucer, which are very cute and fun to play with. Remember, though, that you’ll need a total of 8 AA batteries to power them all; I’d recommend getting good rechargeable batteries to save money in the long run. All of the toys are within reach, and your child can turn 360 degrees while he or she is in the ExerSaucer. It’s a very well designed way to let your child explore the different areas of the toy and experiment with them while getting exercise and learning at the same time. The ExerSaucer can be adjusted to three different heights, so you can make it perfect for your particular child. As he or she grows you are able to adjust it, so they can get as much use out of it as possible. When your child outgrows the ExerSaucer itself, it can be converted into a fun activity table. They can play with all of the toys that are used in the ExerSaucer itself, but no longer have to physically be inside of it. Since most children won’t want to be inside the ExerSaucer once they can walk, it’s a great way to get extra use out of your purchase. You’ll probably want to extend the legs on the activity table as high as possible, making it easier for your child to play without having to bend over. There’s not much to say about the activity table setup that hasn’t been said about the ExerSaucer and play mat; it uses the same toys, but just setup in a way that children can play with it when they can walk on their own. Conclusion: Is the Evenflo ExerSaucer Triple Fun Jungle Worth It? Because many experts are coming out and saying that baby walkers are no longer recommended, bouncers like the ExerSaucer are a very good alternative. All things considered, I think the Evenflo ExerSaucer Triple Fun Jungle is a great purchase, especially if you buy it when your child is very young. Since they should be able to use it up until about 24 months, you’ll get a lot of use out of it, especially if you buy it early. Other than it being rather battery-hungry, there aren’t a lot of complaints about the ExerSaucer. I’ve seen a few random remarks from parents saying that their children outgrew the ExerSaucer quicker than the manufacturer recommends, but unless your baby is very tall—well above average—this shouldn’t be a problem. All things considered, I think that this is a great purchase for any parent that wants a great bouncer that will exercise both their child’s body and mind! Where Should I Buy the Evenflo ExerSaucer Triple Fun Jungle? As of Sunday, Apr 21, 2019 Amazon has a huge discount and free shipping on the ExerSaucer Jungle. Also, it has a no-risk free 365-day return policy if you don’t like it. Simply return it at no cost to you! Click here to see the Evenflo ExerSaucer Triple Fun Jungle on Amazon.com!